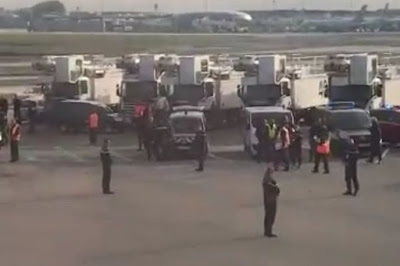 British Airways passengers were flanked by armed officers and searched by sniffer dogs after a "direct security threat" sparked the sudden evacuation of a London-bound plane. 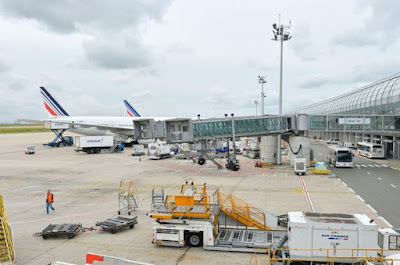 Travellers were escorted from flight BA0303 at Charles De Gaulle Airport, in Paris, this morning. 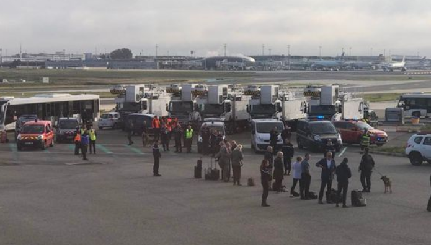 The incident is now being reported as a "false alarm" by police after dozens of security vehicles, armed cops and firefighters surrounded the Airbus A320. The pilot announced there had been a "direct security threat" before those on board were ordered to move "single file" onto the runway. It appears the flight, now more than four hours delayed, will not be taking off and passengers will be forced to book onto a later flight. The threat comes just two days after three fresh attacks against London and France in 24 hours.